Simply put, Dwayne Roloson is on this list because of the part he played in the stunning and unexpected roller-coaster ride the Edmonton Oilers took their fans on during the 2006 playoffs. When the underdog Oilers needed him most, starting in the opening round of the post-season against the Detroit Red Wings, Roloson was the best he’s ever been until the thrill ride ended when his right knee buckled in the goal crease. Absolutely nothing in Roloson’s career as an NHL goaltender to that point led anybody to believe he was capable of the kind of performance he would produce for the upstart Oilers. For eight glorious weeks, 18 games, Roloson blocked pucks, refused to yield an inch of blue paint and seemingly sneered at critics who could not or would not believe what they were seeing. Every save seemed like a “screw you” to the doubters. Then, the play, the knee. Rollie stayed down. Like picking at a scab, Oiler fans who watched their team upset the Red Wings in the first round and then beat the San Jose Sharks and Anaheim Ducks, have replayed what happened with 5:54 remaining in the third period of Game 1 of the Stanley Cup final against the Carolina Hurricanes until they draw blood. The play, in which Marc-Andre Bergeron took forward Andrew Ladd hard into the crease and Roloson, is here. In my mind, it has always been that moment – and the fact the Oilers blew a 3-0 lead before Roloson went down in Game 1 – that turned the series, even though the drama would play out for a full seven games. With Roloson out, replacement Ty Conklin and captain Jason Smith misplayed a puck behind the net that led to the winner by Rod Brind’Amour with 31.1 seconds left in regulation time in that first game. 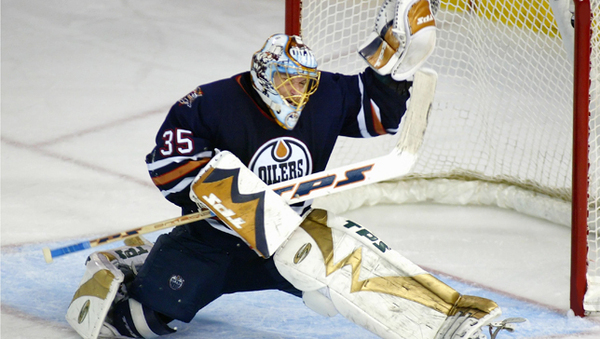 Until the point Roloson went down, he’d been nothing short of magnificent in back-stopping the Oilers that post-season. Acquired from the Minnesota Wild at the March trade deadline, Roloson, who’d never been the clear cut No. 1 on any team during his NHL career, didn’t exactly tear it up down the stretch with the Oilers. Roloson was 8-7-4 with a .905 save percentage and a 2.42 goals-against average in 19 appearances. Then came the playoffs. All told, Roloson was 12-5 with a .927 save percentage and a 2.33 GAA when Ladd slammed into him. He’d make 68, 43 and 63 appearances in three subsequent seasons with the Oilers, but with so many key pieces of that 2006 playoff team gone – Chris Pronger, Sergei Samsonov, Michael Peca and Jaroslav Spacek, to name just four – those three seasons would be the start of the 10-year playoff drought the team is on now. For me, the memorable thing about Roloson was that he battled. He’d scrap for his position in the crease. He dive into a scrum to snag a loose puck. He was absolutely tenacious. He never quit on a play. It’s those traits that saw him provide an encore in another playoff run with the Tampa Bay Lightning in 2011 at the age of 41. Roloson made 17 appearances for the Bolts, going 10-6 with a .924 save percentage. We can’t turn back time of course, but I’ve got to admit I’ve wondered more than once what might have been in the 2006 SCF had Roloson survived that collision with Ladd in the crease, had he managed to get up, shake it off and continue, as he so often did. We’ll never know, but what I do know is I’ll never forget how good Roloson was for those eight weeks. I’ve never forgiven Bergeron or Conklin. Man did he look great in the Heritage classic. Should have had him on a PTO. I can still feel the pain in my chest when he went down in 06. Oil finish that game with a win they take the Cup in 6. Too bad Jussi wasn’t the backup in game one. I think thing’s would’ve been different. Agree. MacT`s biggest mistake was not recognizing the better backup (Jussi) so he rotated the two. Such an amazing run, ended so crushingly disappointing. 10 years later it’s still just as painful to think about. The hockey gods royally screwed the Oilers and their fans that day – fortunately they are finally making things right in the Oilerverse. Oh so right! Number 44 is gonna have to be something special. That ’06 team which means so much to a great portion of this site’s followers would be just a painful memory of failure if the Roloson deal never got done and he didn’t become an Oiler. Roloson was the most pivitol Oiler of that era because the other Oilers of that era wouldn’t be celebrated without him and this would be a top 50 list instead of a top 100. Yes, we watched the old man’s decline here, but we also got his absolute fireball stopping best. The role though that he played on that ’06 team – second only to Pronger – MADE Pisani (absolutely forgettable without that remarkable playoff), got Horcoff his ridiculous contract and for all we know put Katz over the top in his interest to buy the team. That big Oil drop downtown should be called Roloson’s Center (or Place or whatever) not Rogers! OK, the last bit is a bit of hyperbole, but in my mind his place on that 06 team is very difficult to overstate. I would have seen him in the top 20 (But I’ll grant in Edmonton, that’s pretty rarified air). Aside from the ’06 run, the greatest thing about Rollie was when he’d freeze the puck, then bat it out of the zone, tennis style. I’m sure it gave the coaches heart attacks every time, but I absolutely loved it! Rollie was one of the last goalies I can remember who actually had personality. All these goalies today are so normal (relatively speaking). He stoned yzerman on a breakaway. I liked that he was a goalie who found his swagger while playing for us. Too bad things didn’t work out differently, but glad he was here. A solid pick up by Lowe as GM. I still Think Rolly deserved an assist on Sampsonov’s out of the penalty box goal. The puck was clearly directed off his blocker in a perfect redirect pass. I remember Jussi Markkonan (sp?) playing spectacular right through to the 7th game of the 2006 finals as well. Loved Roli the goalie. He represents the deepest of wounds during my time as an Oiler fan. He, his teammates and fans were robbed by a foolish play by Bergeron. Roli zoned in like few others can. No doubt he would’ve been Conn Smythe winner and Stanley cup champ. I obviously love Roli. He’s the reason i started playing goalie and the reson i got into hockey as much as i have. His masks have to be some of the best of all time. Loved the gold cage. Goalies nowadays seem to fall over whenever theyre touched. Roli would be throwing blockers and slashing people who got near his crease. I’m still salty about how he left. He wanted a 2-year contract so his family could have stability but we offered him 1 year. At least he got another shot at the playoffs with Tampa because of that though.